Chances are good that you’ve never seen Pine Lake. Or OK Slip Falls. You can now. Pine Lake and OK Slip Falls are two natural gems of the Adirondack Park that until recently had rarely been visited by the general public. New York State’s historic purchase of sixty-five thousand acres of former Finch, Pruyn & Company timberlands from the Nature Conservancy has put them into the public domain. But how do you get to them? What can you do once you get there? Phil Brown has the answers. 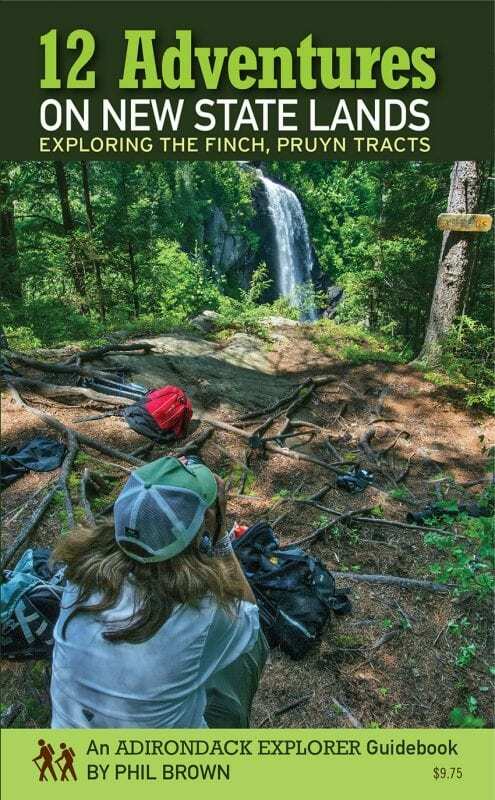 12 Adventures on New State Lands: Exploring the Finch, Pruyn Tracts is the latest in a series of guidebooks by Brown, editor of Adirondack Explorer. The Explorer’s previous guidebooks—pocket-size and slim, but packed with information—covered short hikes in the Keene Valley, Lake Placid, and Old Forge areas. This one is a bit different. For one thing, it provides information on intriguing places that previously were in private hands and offered limited or no access since the heyday of the nineteenth-century Adirondack guides. For another, it covers a variety of recreational activities: hiking, paddling, cross-country skiing, mountain biking, even rock climbing. These lands and waterways became available because of the Nature Conservancy’s 2007 purchase of 161,000 acres from Finch, Pruyn. Much of that land was sold to a pension fund under a conservation easement that allows responsible logging but prevents subdivision and development. Most of the remaining acreage was purchased by the state in increments and added to the Forest Preserve. It is open to the public and will remain forever wild. In his introduction, Brown calls it a “blockbuster deal,” and so it is. Anyone now can visit numerous pleasing and often eye-popping locations that once were reserved for a chosen few. Brown has visited all of the destinations in the guidebook. Like the previous guides, this is an extremely useful book. The description of each adventure is detailed. The book takes the guesswork out of planning by providing precise directions to trailheads, GPS coordinates, easy to-read maps, and more. He lets you know, too, what to expect in the way of challenges. Some of the adventures can be tackled by almost anyone, children included. Others are not necessarily an easy walk in the park. The extras include historical snippets—how OK Slip Falls got its name, for example—and sharp, excellent pictures by Brown and professional Adirondack photographers such as Nancie Battaglia, Carl Heilman II, and R.L. Stolz. The adventures are in the central Adirondacks in the vicinity of Newcomb, Indian Lake, Long Lake, and North Hudson. Some of them offer views of the High Peaks, including my favorite, Algonquin. Besides OK Slip Falls and Pine Lake, the destinations include Boreas Ponds, Essex Chain Lakes, the Hudson and Opalescent rivers, Blackwell Stillwater, County Line Flow, and more. Brown gives a nod to rock climbers with a bonus chapter on Sugarloaf Mountain and Ragged Mountain. This well-designed guidebook is essential for anyone wondering what to do on the former Finch, Pruyn lands. 12 Adventures on New State Lands can be purchased in regional stores or directly from the Explorer.